Hard corals are animals that build small calcium carbonate skyscrapers as they grow. They are disappearing five times faster than rain forests. Some 40 percent of the reefs worldwide are dead or dying. 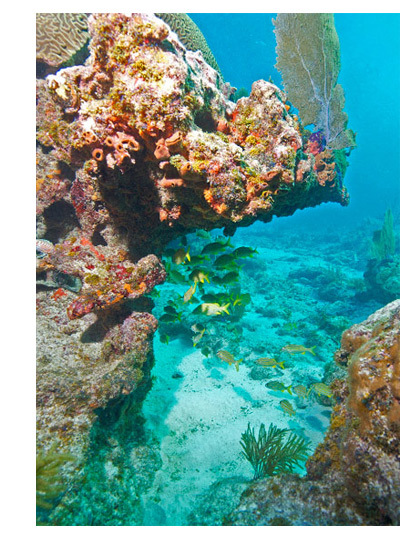 Most of the reefs in the Caribbean are faltering or dead. Humans are largely to blame. Myriad afflictions include overfishing, coastal runoff, and pollution (no sailboat in the world’s largest recreational charter fleet, located in the British Virgin Islands, is required to have a holding tank. Human waste is flushed directly into the sea). Climate change is also a factor because of ever increasing episodes of heat shocks and rising acidity. When a fossil fuel burns, 30 percent of the released carbon dioxide goes directly into the oceans. They are 30 percent more acidic than 150 years ago. The next time you peel a hardboiled egg, drop a bit of the calcium carbonate shell into vinegar. Watch it vanish. Corals are breeding grounds for many fish, they form coastal barriers against storm damage from rising seas, they provide molecular footprints for pharmaceuticals, and they support economies in many poorer countries. Perhaps most importantly, they are the canaries in the oceanic coalmine that surrounds the earth. Oceans host 98 percent of the planet’s biomass and produce half the oxygen we breathe. Massive coral death suggests that something is very wrong. Alter our gluttonous fossil fuel diet. Increase coral resilience to recover by creating ever more Marine Protected Areas. Accept that everything dumped on land ends up in the sea, and live accordingly.